Nordost Leif Blue Heaven is the heart and soul of the Leif series, a fully-shielded design you can use with one component or use several for your complete system - available in a choice of lengths with RCA plugs. It features four, heavy-gauge 24 AWG, silver-plated 99.9999% OFC solid-core conductors, precision wound in a minimum cross-section configuration that eliminates unnecessary fillers or padding elements. Insulation is high-grade FEP, selected for its superior dielectric performance, while the elegant minimalism extends to the carefully selected low-mass connectors and differential grounding. The Blue Heaven LS interconnect (like all Nordost cables) is manufactured and hand-terminated in the USA, enabling Nordost to guarantee consistent performance. Leif Blue Heaven is a high-speed, low-loss interconnect that preserves the sense of musical power and momentum, bringing believable shape and presence to performers, colour, life and drama to their performances. 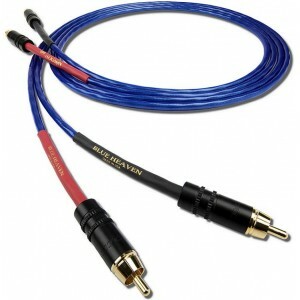 We also sell Leif Blue Heaven terminated XLR-XLR. Please call us if you need advice on which option will suit your equipment.